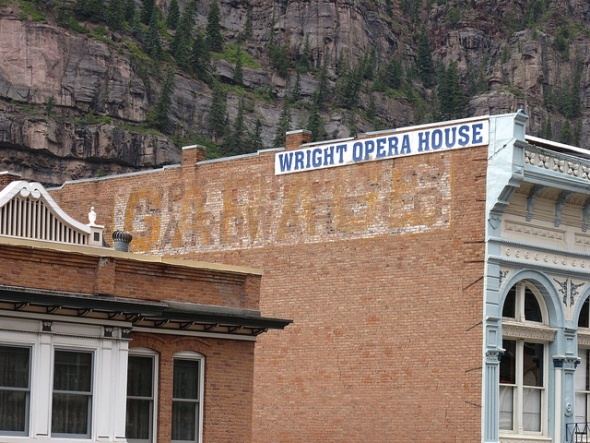 The Wright Opera House was built in 1888 by brothers Ed and George Wright and their wives, Letitia and Lenora. The brothers had made their fortunes with the Wheel of Fortune Mine near Ouray, which they began in 1875 and sold in 1877. The brothers built the Wright Opera House on Main Street to provide cultural programs for the mining boomtown. The building is in Greek and Romanesque style and is notable for a decorative iron façade and a wrought-iron balcony across the second floor, both manufactured by the Mesker Brothers Iron Works of St. Louis. The public entrance is on Main Street, with a stairway leading to the second-floor ticket office and hall, which can seat 500. The Magnolia Band played for a concert and ball for the grand opening of the Wright Opera House on Dec. 4, 1888. The hall was used for a variety of musical, theatrical, artistic, and other events over the years, becoming a cultural center for Ouray. The building, however, languished until the nonprofit Friends of the Wright Opera House acquired the building in 2010 and began planning renovations. The hall is again being used for cultural events while fundraising and renovation work continue, and the ground floor has been leased to retail businesses.